With its "base under siege" format and its chief, in this case Robson (Victor Maddern), whose stress levels have his sanity balancing on a knife-edge, this tale could easily have seemed like a mere retread of themes already well covered in The Tenth Planet, The Moonbase and The Ice Warriors. Robson even sounds like Hobson, the commander in The Moonbase! However, Fury from the Deep has more to offer. For a start, the foes in question aren't the usual men in monster suits that populate the Troughton era, adversaries whose charms are largely lost on audio in any case. Here the enemies are a seaweed creature and the humans it possesses, including the memorably sinister Oak (John Gill) and Quill (Bill Burridge). Sadly we don't get to see their spooky faces as they breathe poisonous gas over their victims, apart from a little image of Quill's ugly mush on the front cover, but the eerie heartbeat sound of the weed in the pipeline still works well. The tone of the story is very atmospheric, with writer Victor Pemberton, director Hugh David and musician Dudley Simpson all turning the creepiness up a notch. The endings to Episodes Two and Three are noticeably subtler than the usual "shock, horror" type of cliffhanger, particularly the climax to the third instalment, as the possessed Maggie (June Murphy) quietly wades out to sea. Pemberton's script isn't perfect by any means. Much misuse is made of the term "alive" and its synonyms to mean "animated" when applied to the weed creature, overlooking the fact that plants are living things. The serial is slightly overlong, though not nearly as tedious as many six-parters. The helicopter sequence in Episode Six would no doubt have looked quite exciting on television, but it tries one's patience without the visuals. And the departure of Victoria (Deborah Watling) from the TARDIS crew is not very subtly set up, with the companion bemoaning the dangers and instability of space/time travel during almost every episode. However, her eventual departure is sensitively handled and well performed by Watling, Troughton and Frazer Hines (who also narrates this remastered presentation - the previous audio cassette version had been narrated by Tom Baker). Our enjoyment of this classic tale is made complete by the presence of a vintage BBC1 continuity announcement at the start of the final episode and a trailer for the subsequent serial, The Wheel in Space, which is also the next story scheduled for release by the BBC Radio Collection. 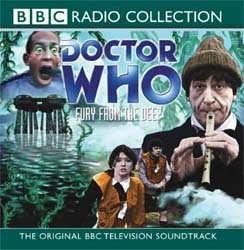 As part of the famous "monster season" of Doctor Who, Fury from the Deep is certainly no weed. (Please note all prices exclude P&P). Click on the logo of the desired store below to purchase this item.